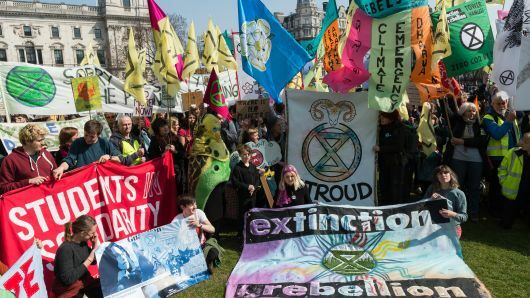 New Orleans Extinction Rebellion is an interesting burst of energy and protest pushing governments, initially in the United Kingdom, to act immediately to avert catastrophic climate change. Bursting onto the scene less than a year ago with actions in the fall and now calling for non-violent civil disobedience during the final two weeks of April, they have been front page news in London. Their hallmark has been hard hitting, disrupting and innovative actions, which I find interesting and worth following. More than 1000 have been arrested in London so far. The Mayor of London mobilized more than 2000 additional police to deal with the disruption. Attempts to confine the demonstrations to the Marble Arch in London have been unsuccessful. Demonstrators have blocked politicians from entering the House of Parliament. Others disrupted Parliament by disrobing there with messages printed on their bodies. Some have super-glued various parts of their bodies, including their rear ends, to public areas to make their point. Bridges, roads, and the London Underground have all been blocked at various times. With Extinction Rebellion’s encouragement, actions have been joined in several other countries as well. At the core of Extinction Rebellion’s philosophy is nonviolent civil disobedience. We promote civil disobedience and rebellion because we think it is necessary- we are asking people to find their courage and to collectively do what is necessary to bring about change. We organise in small groups. These groups are connected in a complex web that is constantly evolving as we grow and learn. We are working to build a movement that is participatory, decentralised, and inclusive. It’s easy to critique this kind of Occupy-lite effort for the climate. They avoid any economic or political analysis adopting a “make the government act” program rather than going after polluting businesses or policies. They are oblivious to class and gender. They don’t worry with sustainability, staffing, or membership. They focus on the Chenoworth 3.5% notion as if it were a biblical guarantee, rather than a shaky post-Leninist notion. So what? Climate change is disruptive to the future, so it needs disruptive tactics to meet the peril and make it immediate, rather than in the by and by. I’m not saying, let a thousand flowers bloom, but it sure wouldn’t hurt to have Extinction Rebellion and some other hellraisers taking action to stop business as usual and increase the heat on policy makers and politicians by demanding – and acting on their demands – until they force a response. Some may take potshots at Extinction Rebellion, but for now count me in the stands cheerleading and leading the applause. Their actions are important and make a difference. By the Way, Workers Are Still Dying on the Job Daily! Little Rock On Wade’s World, I visited recently with Jonathan Karmel about safety on the job for workers. Karmel is 35-year, Chicago-based, labor side lawyer who after years in the legal trenches for unions, had an epiphany when he realized the continuing dangers faced by workers trying to make a living and sometimes dying while trying. Karmel has written a book, Dying to Work: Death and Injury in the American Workplace, that he was hoping would be a wakeup call once again to bring this issue to the forefront. Karmel is right to take up this cause. He notes in the introduction, “One hundred and fifty workers die each day because of their work.” He comes to this figure by adding the daily death numbers from the federal Bureau of Labor Statistics of 4836 workers killed annually based on the most recent statistics before he published the book in 2015, adding up to 13 per day, with the federal Center for Disease Control report that estimates that “annually 50,000 deaths attributed to work-related illnesses – an average of 137 each day.” Add the two figures together, and the tragic math totals 150 per day. It’s safer to be a soldier. It’s not getting better either. It’s getting worse. President Richard Nixon signed the legislation on the Occupational Health and Safety Act (OSHA) almost fifty years ago, but the agency is still underfunded, understaffed, and decidedly unloved by business and their backers in both parties. For example, Karmel points out there is one inspection officer for every 59,000 workers. What? Should we worry? Of course, Karmel advocates updating the regulations, but that’s not happening under the current administration, so let’s look at some of his other suggestions. Two areas would seem to offer some hope. One is more accurate reporting to reduce the under-counting that allows policy makers and business executives to pretend that the “safety first” signs on numerous trucks and industrial gates actually means something. The other is focusing on the state level. There might be some opportunities in some places. Of course, not Texas which allows companies to not bother with workers’ compensation since 1913 and more recently Oklahoma since 2013, so we’re talking about the other forty-eight states. Karmel argues for reform in several areas. First, he questions why after accidents workers are given unreliable marijuana tests, even when not driving and in cases where they were clearly not at fault. Secondly, referral doctors should not be under the employ or contract to the company, giving them a conflict of interest. Thirdly, workman’s compensation benefits need to be integrated into the rest of the health system, especially if we had single-payer. Fourthly, the dispute resolution system should be streamlined. Finally, to make sure there is some other enforcement of fairness, attorney’s fees should be allowed fairly. These moves wouldn’t necessarily be lifesavers, but they would incentivize companies to act more aggressively to protect their workers if the costs they paid, even for deaths on the job, were not so miserly. The rationale of employers, including their argument that there is a “risk premium” in pay that allows workers to accept the risk of injury and death for another buck or two an hour, have to be exposed for the falsehoods they are. Employers, insurers, and governments need to finally value protecting workers’ lives, as if their own lives were at stake without seeing their injuries and deaths as just another cost of doing business.